Suspense and simmering menace pervade “Captain Phillips,” a movie about a cargo ship that is boarded by Somali pirates who take the title character hostage in the hope of scoring a ransom larger than the $30,000 lodged in the safe of the Maersk Alabama, hijacked while sailing alone in the Indian Ocean near the Horn of Africa. Violence can erupt at any minute, and intrigue is rife. “Captain Phillips” provides the satisfyingly uncomfortable tension so many of this fall’s movies have failed to generate. It keeps you guessing, keeps you interested in all that is going on, and keeps you glued to what either of the two main characters might do to set the other off his guard. Although it’s a taut, absorbing drama, much of which takes place in a claustrophobic enclosed lifeboat, the film exceeds the boundaries of an adventure yarn by pitting two shrewd, determined, and perhaps desperate men against each other. Their cat-and-mouse game, their maneuvering between sincerity and strategy, and the penalty for losing make Paul Greengrass’s movie more than a tale of capture and rescue. Tom Hanks, solidly into his character and totally convincing as the cargo ship captain, and the remarkable Barkhad Abdi, a potential Oscar candidate for his wily, threatening performance as the pirate leader, Muse, are worthy adversaries, each playing the other for advantage while making a case for himself as a man with a reputation to uphold and crucial stakes to consider. In bringing this involving psychological conflict to the screen, Greengrass succeeds where other directors, such as Denis Villeneuve in “Prisoners” and Alfonso Cuaron in “Gravity,” faltered. 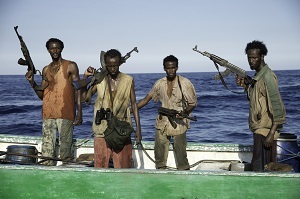 Waiting for Phillips’s escape or rescue raises the blood pressure of the audience, but watching Hanks’s Phillips spar with Abdi’s Muse, and seeing how the Somali responds to various bits of bait keeps “Captain Phillips” engrossing between sequences that involve water cannons and radar and battleships and Navy Seals. By focusing on two men trying to outfox each other, Greengrass takes his film to the personal, individual plane that triggers audience concern and emotion beyond the basic action plot. Richard Phillips is a leader of men. He can be jocular and at ease, but he is just as likely to tell his crew to limit a coffee, or beer, break to the permitted 15 minutes and get back to work. Order is as important as popularity, and Phillips holds each in balance. Phillips sees his mission as getting the Alabama and its cargo to its two destinations as quickly as possible. He chooses a direct route that leaves his ship by itself in the Horn while vessels are being advised to cluster for safety, something radar shows us is being done by other freighters. Muse lives in a bleak desert village that is controlled by warlords. They trundle into town in jeeps, automatic weapons drawn, and insist, in feudal style, they receive money or they will kill all the men in the settlement. To get the money, the men turn to piracy, encouraged by the warlord, in the hope of getting enough ransom, millions if possible, to keep their enclave unharmed and have the warlords provide them, from a distance, with food and other necessities they need to survive. Survival is the underlying story of “Captain Phillips.” Richard Phillips first has to protect his crew from wholesale massacre, then he has to contend for his own life following the kidnapping. Muse leaves his village in one three boats, flimsy motor crafts. His is the only one that latches on to a cargo ship and stages a hijacking. To Greengrass’s credit, he does not give Muse any moral high ground because he comes to piracy by an odd sort of necessity. Muse is pleased to chosen as one of the villagers to patrol international waters and look for prey. He is a pirate by nature as much as by circumstance. He has a talent for the work, and while Abdi makes Muse interesting and conveys how much more there is to his character than meets the eye, the pirate captain never becomes heroic or sympathetic. That role is reserved for Captain Phillips and Tom Hanks. Phillips is frightened by the prospect on being boarded when he sees the pirate’s small motor craft on the Alabama’s radar. He takes evasive tactics and looks as if he has maneuvered clear of trouble, but the ingenious Muse finds a way to thwart him. Once confronted by the pirates in the flesh, Phillips lets his training come through, and Hanks and Greengrass let you see how thorough that training is and how many tasks it covers. Phillips is calm, though apprehensive. He has hidden his men and he believes he can handle the situation. The pirates want money, and he has $30,000 to offer them. If he can ask the right leading questions, appeal to logic, and make Muse and his three henchman believe he understands their mission and wants to cooperate, Phillips is sure he can maintain the upper hand. Muse is too wise for that. He has questions of his own and things he wants proven before he will accept them. His response to most of Phillip’s evasions is, “Show me.” He is a strong leader as well, even if he is coaxed from making a reasonable deal with Phillips by listening to the shouting of the hottest headed member of his crew. The contest begins. Each captain score advantages, and each thinks he is winning. Muse says the operation should be easy, but complications and chaos come quickly. Emotions and extenuating factors cloud logic and reason. All concessions come with a catch, and both leaders know it, so it’s not surprising when deals evaporate, and Phillips finds himself Muse’s hostage as they skim across the water in a lifeboat that looks like a bright orange SmartCar bobbing along, trunk towards the sky, at sea level and heading to Somalia where Phillips will be held until Maersk presumably ponies up more money. Greengrass is clever at one point to show us exactly how tiny and vulnerable the life craft is when photographed in perspective with the ocean and two U.S. Navy ships. The duel between Phillips and Muse entertains. Each man is ready for it, even if Phillips is a bit self-assured — You can see Hanks thinking of next moves or considering how to deceive Muse decisively — while Muse is naïve but benefits from skepticism and reliance on his native wit. As I mentioned, you want Phillips to prevail from the outset, not only because he is the hero played by Tom Hanks, but because he is a captain tending to legitimate business that is interrupted by marauders. Their motive for piracy is moot. They board an unarmed vessel wielding and firing guns, they use strongarm tactics, and they are willing to kill the innocent merchants marines who signed on to do a job, not as soldiers who swear or expect to fight. Even with Phillips in captivity, the chess game between him and Muse continues. The captain manages to get clues to the U.S. naval vessels that prowl the Horn of Africa to discourage trouble and to intervene when it arises. “Captain Phillips” gives people who like to see technology a treat as it closes up on tracking mechanisms and surveillance devices that let you see how targets are found and kept in view. The recent movie, “Closed Circuit,” would have been improved if it used some of the techniques Greengrass employs to show how the Navy keeps tabs on Phillips. The naval operation also adds a military strategy element to “Captain Philliips,” giving it a strong and involving ancillary plot line. The byplay between Hanks and Abdi give “Captain Phillips” a gloss that goes beyond its inherently exciting and tension-filled premise. Hanks gives one of this best performances in years and will most likely be remembered during award season with his first Oscar nomination since 2000 for “Captain Phillips” unless he eclipses himself with his turn as Walt Disney in the movie, “Saving Mr. Banks,” due for release in December. As Phillips, Hanks nonchalantly goes about doing the various tasks it takes to be the commander of a seagoing vessel. He knows not only sailing and navigation but about the way the ship’s galley and medical department work. He is someone who is prepared for anything, and the confidence shows as you see him on his various rounds before the pirates even threaten. Before and after the hijacking, Hanks shows you Phillips is a capable man. The performance is natural. Hanks fits in to the role of a captain who, like his men, is a workaday employee of a company that supplies a service. He just happens to be the employee in charge. He gives orders firmly and brooks no nonsense, but he is not a polished leader. He looks like one of the guys and takes his work seriously while realizing it’s just a job. The approach of the pirates puts Phillips in the role of a decisionmaker, and he has to act quickly. Hanks doesn’t break stride or overdo this role. He takes command. You can see some smugness on Hanks’s face when he thinks he can easily outsmart Muse, but that look of confidence turns to contemplation about how to countermove when Muse resists, makes demands, or asks for proof. Hanks’s acting remains solid and pitch perfect throughout. He is realistic, and more affecting for it. His Phillips engenders audience respect and regard, and one feels for the captain in a scene in which Phillips is not sure he will be able to escape the pirates’ wrath and breaks down while thinking of his wife and sons in Vermont. Hanks goes through a wide range of emotions and keeps everything to a human scale. His is a good, canny performance, and the movie benefits from him being an ordinary man with some well-honed skills in dealing with difficult situations and handling men. Barkhad Abdi is exotic looking to a Westerner. Tall and unimaginably narrow, with limbs and a waist so thin they look as if they can be broken effortlessly in two, Abdi’s Muse is scary and threatening at first sight. When Greengrass focuses on Abdi’s long, crooked, skinny fingers, digits that look like they’ve been crafted by a make-up department for a witch or an animated tree, the effect is eerie and frightening. Abdi, or Muse, also has a huge lump on the left side of his forehead, adding to the image of someone otherworldly and dangerous. Muse surprises by how soft-spoken he can be when he is not issuing demands or squabbling with his fellow pirates. Abdi also shows charm when Muse becomes philosophical. His craftiness as a negotiator is also unexpected. Muse is a complex character, and Abdi takes the character beyond being the figure who set the action in motion, to one who fascinates. Like Hanks, he is natural in his portrayal. Bringing Muse to a human level enriches “Captain Phillips” and makes it more engaging to watch. Abdi’s African castmates, Barkhad Abdirahman and Faysal Ahmed, also score well in the movie, Abdirahman playing a teenager torn in his loyalty, and Ahmed as the temperamental pirate whose behavior spins Phillips’s situation out of control. Since “Captain Phillips’s” release, much has been said and written about the accuracy of Billy Ray’s script and about Alabama crewmen suing Phillips for stubbornly insisting on the isolated sea route that led to the calamity. From a film perspective, none of this matters. “Captain Phillips” is not a documentary or a history lesson. It is a story about one man’s ordeal and another man’s refusal to be handled as if he didn’t have power and a point of view of his own. The movie is effective in all areas it covers. It is exciting as a hijacking story. It evokes and maintains honest suspense during the kidnap and rescue sequences. It remains involving when Ray’s plot turns to military maneuvers. Most of all, it excels in telling the human story of two men on missions who clash as adversaries that put on a civil demeanor while parrying for the upper hand and eventually resorting to extreme measures to be the one who prevails. The movie is a good and entertaining one. Hanks and Adbi take it to a level that make it compelling. This entry was posted on October 16, 2013 by nzoren in Movie Reviews and tagged Adventure, Barkhad Abdi, Captain Phillips, Hijack, Maersk Alabama, Movie, Paul Greengrass, Pirates, Richard Phillips, Tom Hanks.